The Astoria Scandinavian Midsummer Festival Association has named Jorgen Madsen of Astoria as grand marshal for the 2019 Op Tog Walking Parade, which takes place at 11:30 a.m. June 22 at the 52nd annual Scandinavian Midsummer Festival at the Clatsop County Fairgrounds. Madsen was born in 1934 in Karleby, Denmark. His wife Berit is from Norway, and together they immigrated to the U.S. in 1964. In 1974, after attending their first Midsummer Festival in Astoria, they decided to move to the North Coast. When Madsen served as chairman of the Midsummer Festival Association for three years in the late 1970s, he added the Santa Lucia Festival of Lights to Astoria’s holiday calendar and added Iceland to the festival. Also in the late 1970s, he became involved with the Scandinavian Hour, a weekly radio show on KVAS. In 1998, he passed the torch to his daughter, Sonja Madsen, a former Junior Miss Denmark, and she continued until the show’s end in 2004. Madsen’s involvement in the Scandinavian Midsummer Festival spans 45 years. 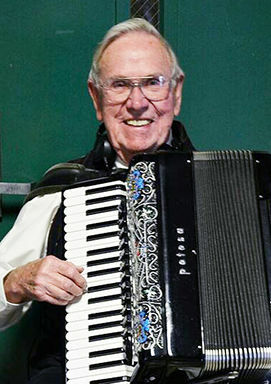 He has sung the Danish anthem at the festival every year since 1975. His oldest daughter, Ann, was crowned Miss Scandinavia in 1984, and his granddaughter, Jodi, was crowned Miss Scandinavia in 2009.